and a short walk to the town centre. 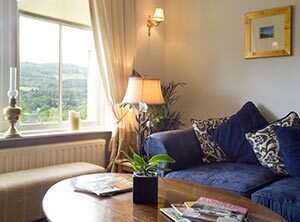 A cosy downstairs sitting area with great views across Pitlochry rooftops and the Tummel valley. Beinn Bhracaigh (Gaelic, pronounced ben vra key) is named after Ben Vrackie the 2757 ft hill above Pitlochry, a favourite destination for walkers. 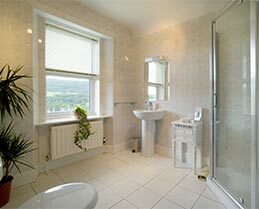 It is owned and run by Kirsty and James Watts, who welcome guests to stay for bed and breakfast in 10 nicely designed and styled modern bedrooms with en suite bathrooms. 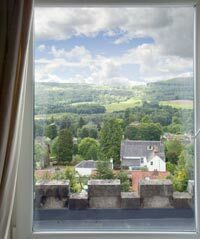 It is just above Pitlochry town center (where there are lots of woolen and outdoor clothing shops, as well as some great walks around the parks, the Festival Theatre and Hydro Dam and salmon ladder) and an easy walk to and from the shops, pubs and restaurants. 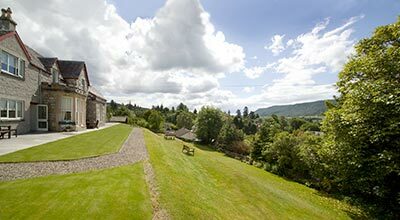 The house is Victorian with later additions, in a quiet residential area with views from every room over the town and the Tummel valley to the hills beyond. Kirsty and James are friendly and welcoming hosts who are always happy to give guidance about how to make the best of your explorations in this wonderful part of Scotland. 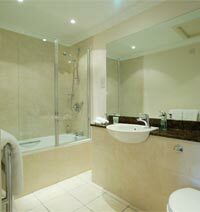 All bedrooms have en suite bathrooms with bath and/or shower, wc and basin. 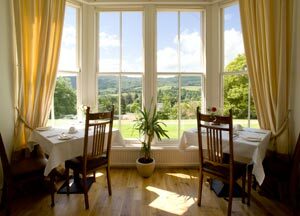 All are decorated and furnished to hotel standard with comfortable beds and linen, televisions, tea and coffee trays and and a selection of fine Scottish toiletries. 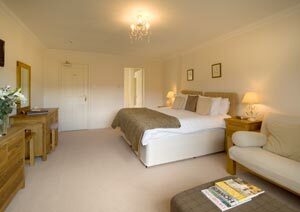 All the bedrooms have similar views over the town and valley. 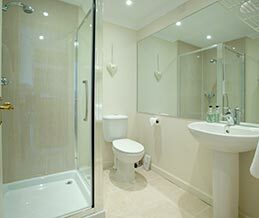 Left and right; Superior Double or Twin bedroom with bathroom en suite (bath, shower over, basin and wc). Left and right; Classic Double or Twin bedroom with bathroom en suite (shower, basin and wc). 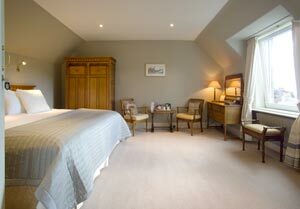 Classic Double bedroom and shower-room en suite. Full Scottish Breakfast served in the Dining Room (right). Eggs, Bacon, Mushrooms, Stornoway Black Pudding, Potato scones, sausages, tomato, and Vegetarian options. Kirsty's own fresh fruit salad ("totally delicious!" - AboutScotland Editor). Continental breakfast which can be served in the dining room or in your own room. Croisants, breads, oatcakes, cheese, pâté, ham, yoghurt. French Toast, with sugar or plain. Potato Rosti (house speciality) with oven dried tomato laced with garlic, olive oil, oregano and thyme topped with a layer of melted brie and crispy bacon. Tea, Blended, Earl Grey, Herbal, Coffee, Decafeinated, Cafétière, Hot Chocolate, Toast, White or Brown Bread. The buffet table is set with cereals, yoghurts, fresh fruit, fruit juices and a selection of breads, and you can start the day with a warm hearty bowl of porridge. 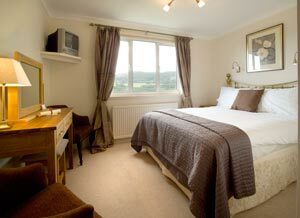 £41.50 to £49.50 per person per night based on two people sharing a room, and including breakfast. The price range depends on the season and the room. Arrival after 4pm please. Departure before 10.30am. Cancellations made 7 days or more prior to arrival date, 1st night charged, unless can be resold. Cancellations made less than 7 days prior to arrival date, or 'No Shows', full charge made, unless can be resold. Children over 8 years are welcome. 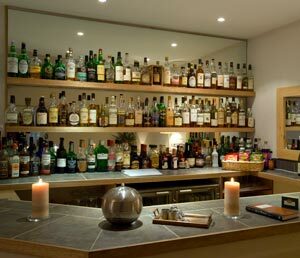 The bar (with its own lounge) is open in the evening and as well as wines, beers and liqueurs has over 50 different Malt Whiskies. With a book of tasting notes and cosy surroundings this is a great place to explore the world of Scottish Malts. Please tell Kirsty and James you found Beinn Bhracaigh through About Scotland!